I have a lot of trouble with self-condemnation. As I child, I wasn’t given compliments. Instead, my faults were constantly highlighted. I have lived with the fear of failure for so long, that anxiety has become a companion for pointing out my imperfections. This is no way to live! I’m learning not to judge myself. I wouldn’t judge my children or my friends the way I judge myself, so I’m trying really hard to give myself a break. It’s difficult, but I’ve come so far from where I once was. I’m understanding that it’s a sin to judge myself. I have to ask God to forgive me, and to help me see myself through His eyes. I tend to feel very low when I haven’t accomplished anything by the end of the day. Today was a day that left me exhausted and unmotivated. I couldn’t really accomplish anything at all. But my husband reminded me that it’s ok. And God has been helping me. I thought I’d look for the silver lining in my day and search for the teeny tiny things that I did accomplish. I’m hoping to encourage you to do the same, if you too, are struggling with self-condemnation. 1. Making my bed (It’s the one thing I make myself do every single day so I will accomplish something when I first wake up). 2. Not freaking out when my husband came home with a migraine, which meant my one free day was shot, because I had planned to do a project in my bedroom (That’s selfish, I know, but wait! This blog post is about no self-condemnation!). 3. Helping my husband to rest and recover by: closing the blinds, getting him herbs and juice, and exiting the bedroom. (I can be selfless!). 4. Letting out my neighbors’ animals for some exercise, since they would be late returning home from a long weekend trip (We enjoyed the sweetness of all the pets that made us laugh with their adorable personalities!). 5. Texting a teen friend, and letting her know that even though we may disagree, I love her. 6. Starting summer reading fun with my daughter for tiny prizes (I bought some packs of teeny tiny animals from Hobby Lobby. She has to read me a book each day to earn one.). 7. 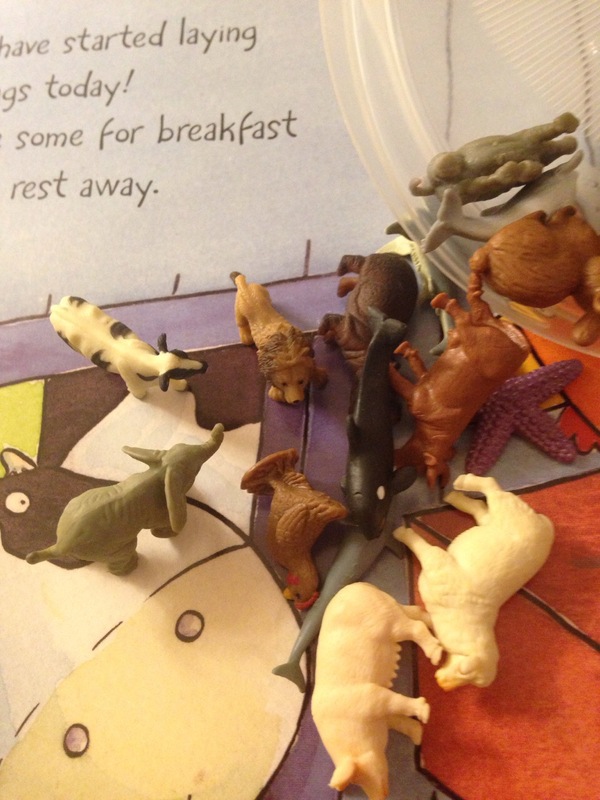 Not caving and giving my daughter all the teeny tiny animals at once when she asked to play with them. 8. My teen telling me “Good job Mom!” when I didn’t cave in to my daughter’s request. 9. Running to my daughter and hugging her in the moment when she asked for help with something, telling her how much I love her, and having her return to me and ask if she could have another hug like that! 10. Quality time to seriously talk with my teenage twin boys, in spite of them acting completely crazy, interrupting me, and constantly making me crack up with their crazy jokes. 11. Family prayer time (This is the time we gather together at the end of every single day in order to pray for each other, and family, and friends. It’s a reminder that we are a tight family unit with Jesus at its center.). 12. Knowing I’m blessed and loved by God, because He has given me a family to love, who loves me back. He wraps His arms around us and provides us with everything we need. I’m super bummed that I couldn’t accomplish the feat of locating the bag of new taco flavored DORITOS that my son and I were craving. But hey, less calories! And on top of that, I wrote a blog post! I think, though, that the brightest silver lining just may be that today’s teeny tiny tiny accomplishments will in some small way lead to something bigger and more important. In fact, I just realized that today’s fatigue may be due to having battled anxiety this week. Today I woke up without it. I battled it this week by spending time in prayer, and focusing on God’s truth. My husband battled for me too. Perhaps that’s why he has a migraine today. My family is tired, but we’ve come a long way. It’s ok if I didn’t accomplish all the things I wanted. God loves me anyway. One step at a time. Love yourself. Addendum: Immediately after writing this blog post, I peeked on Facebook and was surprised, and delighted, to find the most kind and beautiful note from my dear, treasured friend who was also my student years ago. She wrote about the teeny tiny things I did as a teacher, which brought her joy as a student. These teeny tiny things led up to her becoming a teacher. These, added onto the teeny tiny things she has done for me, have led up to our lifelong friendship. Our friendship has led up to me having the privilege of leading her to accept Jesus Christ as her personal savior. I can think of no better illustration as proof that teeny tiny accomplishments lead to bigger and better things. God’s timing is amazing! Take heart! Teeny tiny animals lying on top of the book, A Day on the Farm: illustrated by Sue King and written by Cathy Drinkwater Better. Thank you for this. I think that you accomplished so much more than you thought you did. What a great idea to make a list. And, just think about the encouragement your blog gave to people who read it. Thank you for such precious words of encouragement, and for loving me with words of affirmation, which are the very opposite of condemnation! God really does know what He is doing, even when we can’t see it, doesn’t He? I’m so blessed to know God can work through me even on my rough days, just like He does with you. You’re a child of God, and so am I. Let’s straighten our crowns and walk proudly in God’s grace!